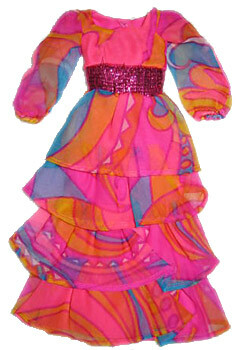 This beautiful and hard to find ensemble features a long dress in hot pink with a very mod multi-color print. The dress is made of organdy and lined in hot pink nylon. The skirt had four tiers. The sleeves are not lined and are extremely fragile. It is very common for the sleeves to have major problems with unraveling - many times they are missing completely. The dress has a wide lame waistline in cerise, which is a fancy word for purplish red. In French it means cherry red - but is used for purplish red in English - go figure. The stole is made of the hot pink nylon that lines the dress and the other side is the cerise lame from the waistband. The black butterfly choker is extremely hard to find - although repros are available. It should have two yellow beads. The matching red closed toe shoes, also called cerise, are also very hard to find.